Castro’s Pub is a compelling tradition and an institution. 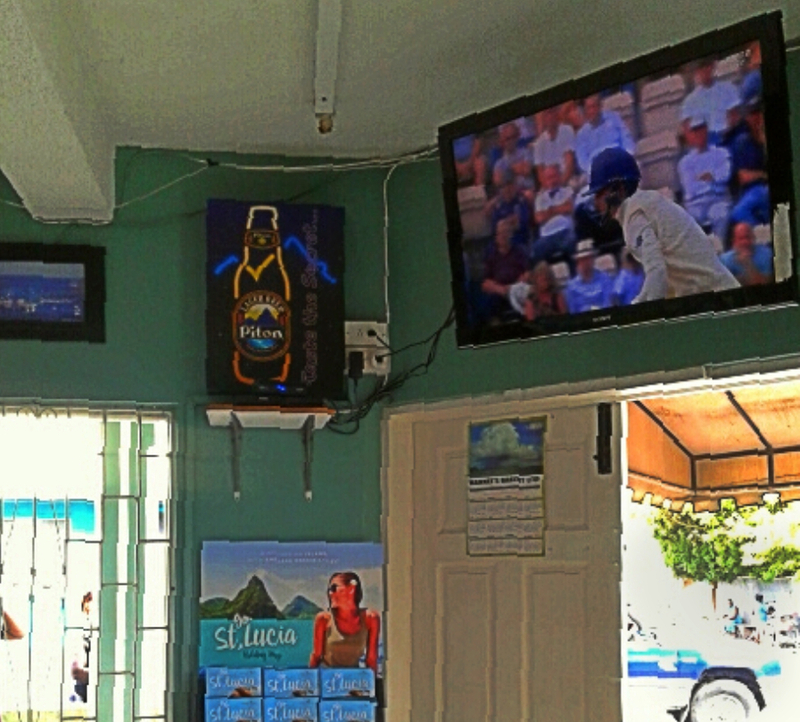 The watering hole and eatery is not just a well-known point of reference for visitors to the town of Gros Islet, it is a must stop for locals who have designated it an extension of their most comfortable place – home. Amongst the north’s oldest and most popular bars, Castro’s is where visitors can immerse themselves in a microcosm of Saint Lucian social life and traditional local cuisine, while engaging in either thoughtful or frivolous banter. Everyone is made to feel welcome. There is an easy familiarity and camaraderie amongst Castro’s regulars – an imperfect constant in a world of change. A reviewer on TripAdvisor recommends alongside the pub’s wide array of alcoholic and non-alcoholic beverages, “a sense of humour as a requirement.” Sound advice, because Castro’s wasn’t conceived to be a place where you take yourself too seriously. 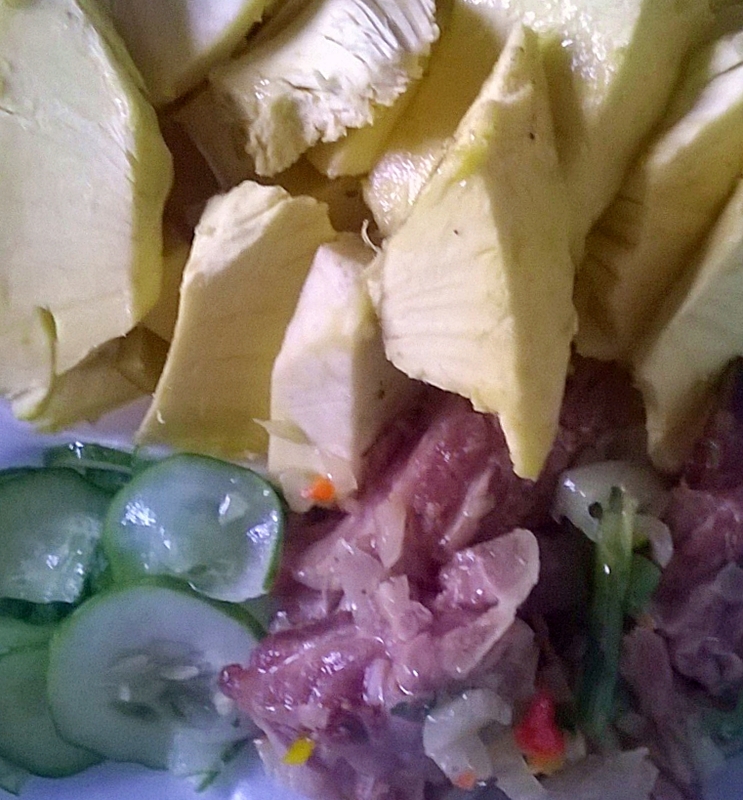 On Souse Saturdays, tongue-in-cheek pontification is de rigueur over a bowl of cow heel soup or stew pig tail and an ice-cold Piton beer; the southern twang of a Reba McIntyre or George Jones song teases at a respectable level in the background. The only serious business here is the amity, drinking and eating. The establishment has gained a reputation for playing objective host to politicians from both sides of Saint Lucia’s parliamentary aisles, prominent businessmen, intellectuals, pensioners with nothing but time, and professionals of every stripe. Tourists too. They all hold court downstairs the two-storey structure at the corner of Dauphin and Marina Streets, where passers-by become more interesting, the longer the shadows stretch across the sidewalk. The pub is the quintessential representation of a community’s social gathering point where hot topics enter the nebulous realm of circular debates, calendar events are observed, birthdays celebrated, rivalries salved with equal measures of picong and golden liquor, and friendships forged. But everything is done Castro-style. There is respect. You would be hard-pressed to find someone with a hard word, except in total jest, of course, about its founder and namesake, Bernard “Castro” Louis. Castro, who departed this life in January 2018, was a pillar of the community who performed much of his philanthropy away from public view. He participated in sports through North Stars Cricket Club, and represented Gros Islet residents as a counsellor in the 70’s. He was a founding member of the Gros Islet Taxi Association, having operated a mini bus himself. Based on publicly expressed sentiments after his passing, Castro appears to have positively impacted many lives, not just in Gros Islet, but far beyond the island’s shores. The bar’s continuing traditions now reside in the hands of his first daughter, Kimberlyn McPhee. Kim, as she is known by friends, and the entire pub’s clientele, now has to guide the establishment through a new digital life after Castro, while maintaining the core tradition of a bar fashioned from the ideals of another generation. She has expanded the menu to include some of the most exotic local culinary accompaniments to imbibing. “We serve trotter (pig feet) souse, chicken feet, pig’s ears, snout, tripe soup, octopus, twi-twi (sandsmelt) and saltfish accras, bwigo (sea snails) and fish guts. We also offer regular meals for the less adventurous, like stewed turkey, lamb, pork and beef.” Fish guts? Yes, it is self-descriptive, but looks nothing like that in the bowl, and is absolutely delicious. If your palate is averse to jiggly, gelatinous textures, except for perhaps Jell-O, then make a beeline for the culinary path more frequently travelled. 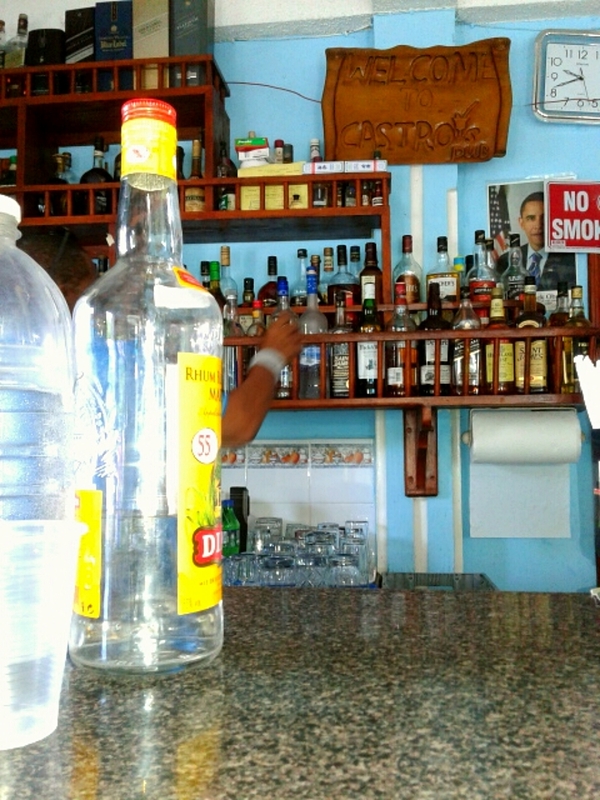 As part of Castro’s very gradual make-over, McPhee is revamping the bar’s annual calendar of activities. 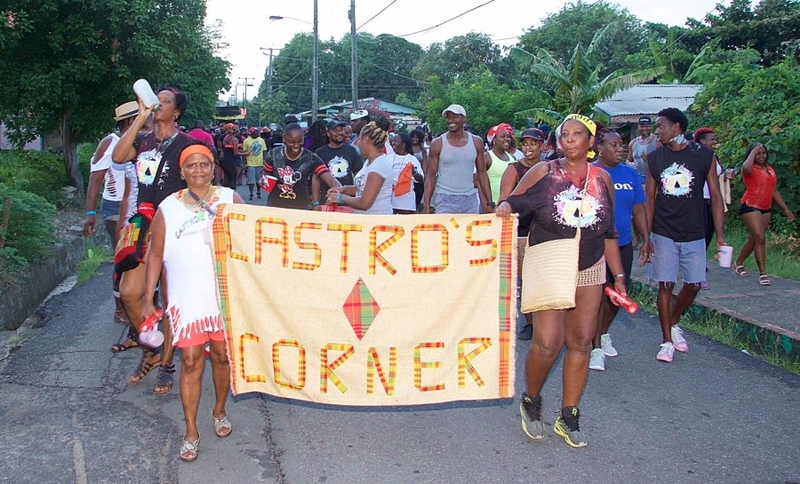 They have twice successfully presented Castro’s Corner J’ouvert Band in Gros Islet’s community carnival, which coincides with Emancipation Day. On both occasions their themes were Afrocentric, depicting “Mama Africa” and “Freedom”. On December 13th, National Day, the pub goes into music and dance mode with their “Solo Ko Castro” event – a melange of traditional dances such as la comette and kwadril enjoyed to a live performance by a folk band featuring the fiddle (violin), banjo and chak-chak (rattle). 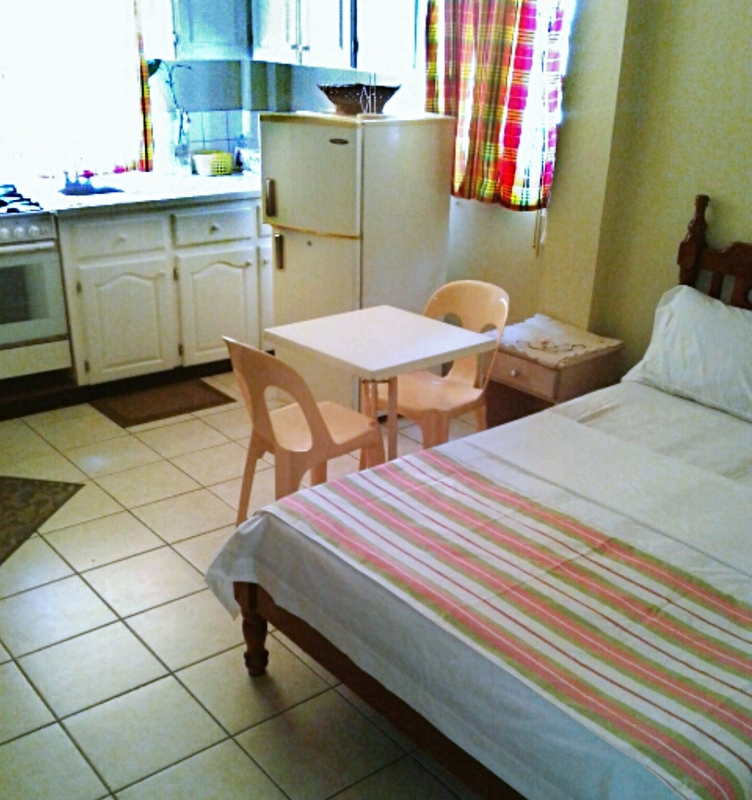 Kim is also going to maintain the four self-contained rooms above the pub, which allows visitors an authentic taste of life in a small, quiet Saint Lucian town. There are extensions of the accommodation business off-site, and include a four and a two-bedroom homes and an upscale three-bedroom property with swimming pool. McPhee says there is a lot to do, but she hopes that her father, is watching. “He can sit back and know that I didn’t disappoint him.” Too true Kim. Castro’s is going to be around for a while. Turn right off the main Castries-Gros Islet highway onto Dauphin Street in the town of Gros Islet. Keep going straight along Dauphin Street passing three intersections. 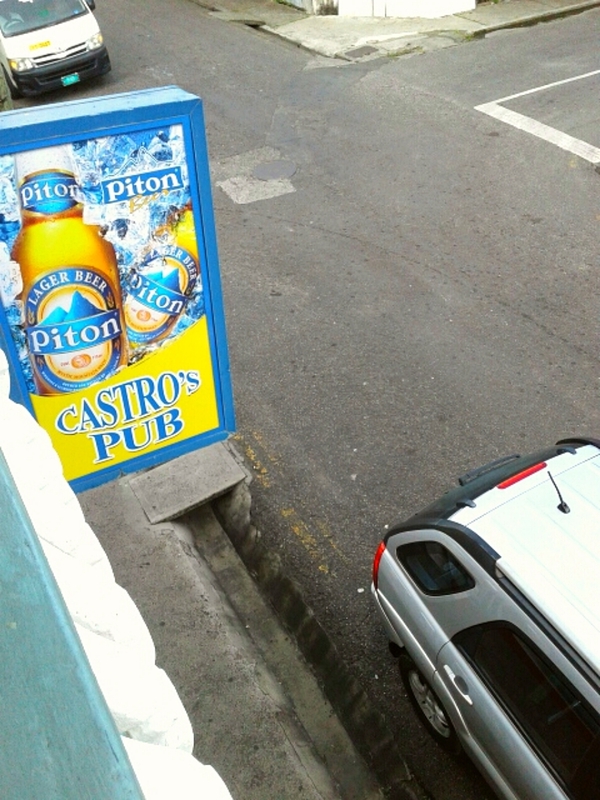 Look for the “Castro’s Pub” sign along the left-hand side at the fourth intersection with Marina Street. Castro’s is a cream two-storey building with mint-green/white trim. A veranda wraps around the roadside views of the establishment. On Dauphin Street Castro’s Pub is opposite a local car wash business. 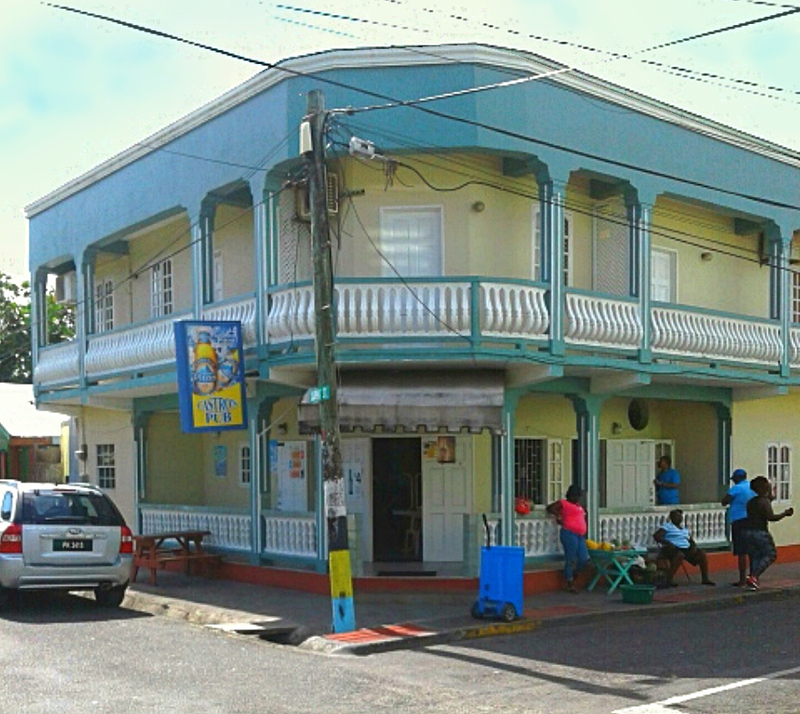 This intersection serves as an informal bus stop for Gros Islet residents. Parking is available along the streets near the establishment. There is also an empty lot on Marina Street next to the car wash.
« Yoga with Ja – Yoga in true island-style! 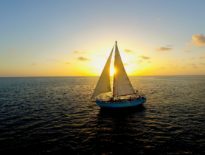 Take a Class	Yoga with Ja – Yoga in true island-style!